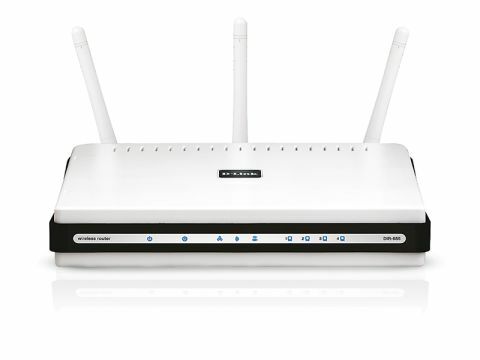 The D-Link DIR-655 Wireless N Gigabit Router has been available for over 12 months and is now seen as something of an entry-level router in the range. However, it still manages to include all the features we've come to expect from a well-equipped domestic router. The black and white design is boxy and lacks the flair of the Belkin or Linksys devices, but it's compact enough to hide away on a shelf. Plug the router in and you will find a row of LED activity lights line the middle of the box. On the rear of the unit there are three antennas that can be angled to help you maintain a strong and usable signal. Ports on the rear consist of four Gigabit Ethernet ports, a modem and a USB port that is used in partnership with Windows Connect Now to help keep your network secure. Installing the drivers and software is quick and easy and you'll find the interface simple to get to grips with. Once you've set up the security levels, you can configure the router to give specific bandwidth, either to online games or VoIP services, such as Skype, using the built-in Ubicom Stream Engine. This lets you easily prioritise your most important software for optimum performance, at the expense of other, less important applications, and is a nice touch. We set up this router in conjunction with a D-Link DWA-140 Wireless N USB Adapter (£27 inc. VAT), which is a rather large dongle, but we found signal strength to be more than acceptable. The adapter also includes a small stand, which can help improve overall signal range should you need it. In use, we found the performance of this router to be satisfactory. While it doesn't have the strongest signal – that honour goes to the Linksys N Ultra RangePlus WRT610N – it's fine for smaller homes and works best in more open-plan spaces. Although the D-Link DIR-655 Wireless N Gigabit Router may not be the best looking router, it certainly offers great value for money. It is also easy to set up and manage, making a great all-round package for first-time users in particular.